Paget's disease. Coloured combined computed tomography (CT) and single-photon emission computed tomography (SPECT) scan of a section through the head of a 70-year-old female patient with Paget's disease, showing thickening of the skull. Paget's bone disease is a disorder of bone production where the normal rate of bone turnover is disturbed. In the later stages of the disease, bone is made faster than it is broken down. This leads to the formation of thick, but structurally weak, painful areas of bone. 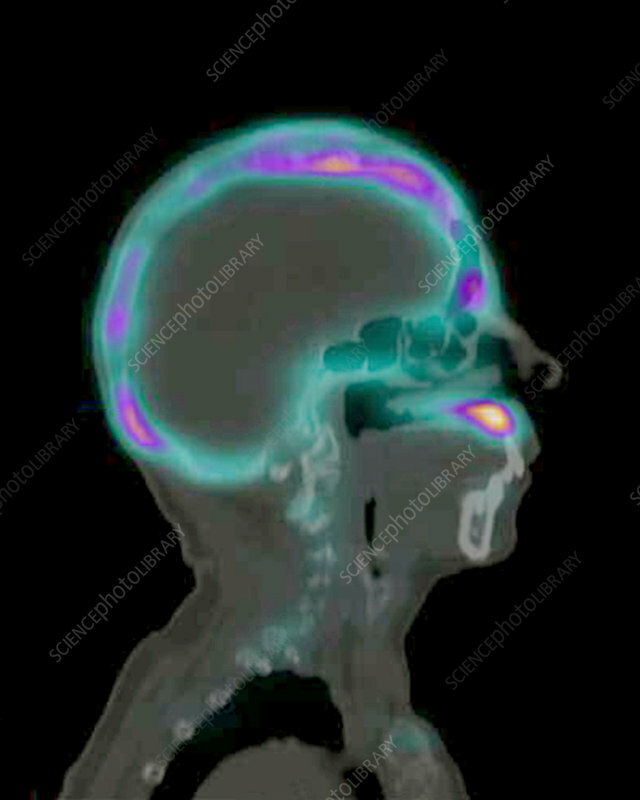 Here, increased radiotracer uptake (colourful) can be seen in the skull due to abnormal and excessive remodelling of the bone.